The Albanian Film Week 2013, now second years old, welcomed Albanians from all around the globe in the opening ceremony on November 8, 2013 at the SVA Theater in Manhattan, New York.The festival opened with Albania’s 2013 Oscar Contender “Agon” directed by Mr. Robert Budina. 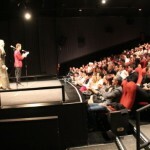 Hundreds of Albanians, including actors, directors and producers were present at the SVA Theater on Friday night; hosted by the team members of the AFW and interviewed by Albanian American Vision network TV. But what is unique about the Albanian films showing this year is that the majority of them are inspired by true stories, depicting many diverse issues ranging from family to personal everyday struggles and the difficulties of war and strife. 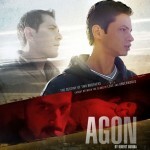 For instance, Mr. Robert Budina, director of the movie “Agon,” who currently lives in Tirana, Albania, said that he was ecstatic to be at the AFW festival and it was important for him to make a personal connection with Albanians and Americans in order to get a clear message out regarding his movie. The ideas on the film were born from true events, the struggles of friends and acquaintances that the director met throughout his life but also his personal difficulties as an immigrant in Italy. “The ideas about the movie came from many discussions that I had within my family, topics on how to live a good life in Albania. Taking in consideration that 40 percent of Albanians live outside Albania today as they are disappointed of struggles in the country, Albanians are willing to do anything it takes to prevent their family from discord. Based on my brother’s struggles to find a job and provide a good life for his kids in Albania, I decided to put together an idea and a story, a movie about two brothers. Consequently, this movie is all about family and love.” said Mr. Budina. Ariot Myrtaj , the co-founder of AFW said that he was inspired to organize this festival in order to “tell the world about the Albanian culture and history and the world will only learn more about who we are through art and culture.” In addition, the marketing director, Theodora Rexhepi who has worked extremely hard with the rest of the AFW team to make the AFW second edition an unforgettable experience for everyone stated that, “Friday night was a spectacular night. It was very fulfilling to see that all the hard work our team invested in is now paid off. I was extremely happy that people enjoyed “Agon” and the after party as well. Our goal was to excite people and leave them with a great feeling of satisfaction”- Rexhepi. 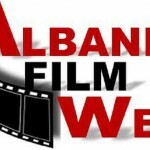 The AFW opening night was concluded with Q&A by the Director Roberto Budina where he explained once again the importance of his connection with the Albanian and American public. As the night came to an end at the SVA Theater, the crowed continued the festivities and celebrations of the successful opening of the AFW at the prominent, beautiful and entertaining club of Tenjune in New York City’s Meatpacking District.